Mariano Rajoy’s time as Spain’s prime minister appears to be over after the opposition Socialists secured parliamentary backing for ousting the conservative leader. Lawmakers from the Basque Nationalist Party (PNV) announced Thursday that they would back Socialist leader Pedro Sánchez’s motion of no confidence in Rajoy in a vote to be held Friday. With the PNV’s support, and that of the far-left Podemos and Catalan pro-independence parties, which is all but guaranteed, Rajoy will be forced out and replaced as PM by Sánchez on Friday. If the parties vote as they say they will, only a last-minute resignation can prevent Rajoy from becoming the first Spanish prime minister to be ousted in a motion of no confidence. The Spanish prime minister, Mariano Rajoy, looks set to be ousted in a no-confidence vote over a corruption case. The motion, filed by the main opposition Socialist party, looks set to pass with an absolute majority after the Basque Nationalist Party said its five representatives would vote against Mr Rajoy on Friday. If there are no U-turns, their decision will mean a majority of more than 176 voting against Spain's leader, following a Socialist party push to secure smaller parties' no confidence votes. It would mean the fall of Spain's government, an end to Mr Rajoy's eight years in power and would place Socialist leader Pedro Sanchez in the Prime Minister's seat. Mr Sanchez has called on Mr Rajoy to resign before what he says is an imminent ousting. Socialist leader Pedro Sánchez, who filed the motion after Mr Rajoy's party was implicated in a corruption scandal, will become prime minister. "We're going to sign a new page in the history of democracy in our country," Mr Sánchez said ahead of Friday's vote. The leader of the Spanish Workers' Socialist Party took over as Spain's prime minister on Friday, after a no-confidence vote spurred by a corruption scandal ousted conservative leader Mariano Rajoy. 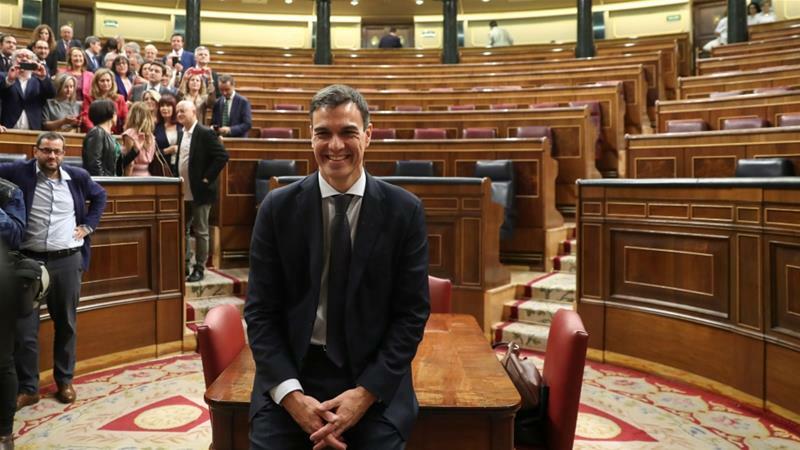 Pedro Sanchez won the no-confidence motion with 180 votes in favor, 169 against and one abstention, according to the Associated Press. He could be sworn into office as soon as Saturday. The report notes that Rajoy's ouster by parliament is a first for a serving leader in four decades of Spanish democracy. Rajoy's no-confidence vote in parliament was prompted by a corruption trial that has involved multiple members of his center-right party, and his departure puts Spain into a precarious political landscape, according to NBC News. (Al Jaazera) Socialist leader Pedro Sanchez has become Spain's seventh prime minister after a no-confidence vote in parliament unseated Mariano Rajoy's conservative government. Sanchez vowed on Friday to address the "social emergencies" of the country's citizens after years of austerity measures. The 46-year-old, who is the head of Spain's largest opposition party (PSOE), was sworn in by King Felipe VI on Saturday and will appoint his cabinet over the coming days. For Sanchez, it has been a strange turn of events over the past two years - from losing the leadership of his party to becoming prime minister. When PSOE lost heavily in the 2015 parliamentary elections and his bid to become prime minister the following year failed, Sanchez's political future did not look so bright. Sanchez's supporters say he has a calm personality and a talent for compromise. Pedro Duque earned a degree in Aeronautical Engineering from the Universidad Politécnica de Madrid (UPM) in 1986. He worked for GMV and for the European Space Agency (ESA) for six years before being selected as an astronaut candidate in 1992. Duque underwent training in both Russia and the United States. His first spaceflight was as a mission specialist aboard space shuttle mission STS-95, during which Duque supervised ESA experimental modules. In October 2003, Duque visited the International Space Station for several days during a crew changeover. The scientific program of this visit was called by ESA/Spain Misión Cervantes. He has worked at the UPM, in the Escuela Técnica Superior de Ingenieros Aeronáuticos, and at Deimos Imaging. Currently he is back as an astronaut of ESA, and leads the Flight Operations Office near Munich. On 6 June 2018, he was named Minister of Science, Innovation and Universities of the Government of Spain. Spain's Socialist Prime Minister Pedro Sánchez has given 11 of his 17 cabinet posts to women, a higher proportion than anywhere else in Europe. A self-styled feminist, Mr Sánchez's choice was in marked contrast to the male-dominated executives of ex-PM Mariano Rajoy, ousted last week. Women are given some of the biggest jobs including the defence, economy, finance and education portfolios. An ex-astronaut, Pedro Duque, has been given the role of science minister. Mr Sánchez's mix of party colleagues and experienced figures from outside politics is being described in Spain as a "feminist cabinet". In a televised statement, he said his new government was made up of people who "shared the same vision of a progressive society that was both modernising and pro-European". Interesting considering how Spain was literally a fascist country as recently as 43 years ago. 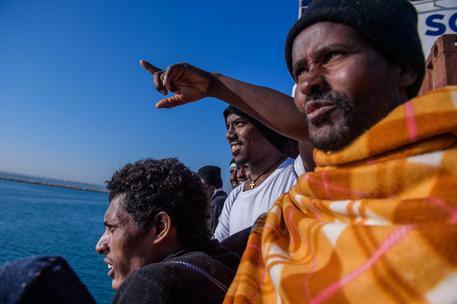 (ANSA) - Rome, June 11 - Spain on Monday said it would take in a German NGO ship with 629 migrants on board after Italy's new populist government blocked it from Italian ports on Sunday. The Aquarius will be allowed to dock in the Spanish port of Valencia, Spanish Premier Pedro Sanchez said Monday, spurring Interior Minister Matteo Salvini to say "raising your voice pays". The decision ended a stand-off between Italy and Malta after Salvini, leader of the anti-migrant League party, said the ship run by SOS Mediterranée could not dock in Italy and said Valletta should take it. Malta refused, saying the migrants were picked up off Libya in an area that is Italy's competence. After Sanchez's statement, Salvini said: "Evidently raising your voice, something Italy did not do for years, pays". When a new Socialist premier took office in Spain on June 2, the Catholic Church was careful to emphasise its readiness to co-operate. Yet within barely a week, as tensions emerged over Pedro Sánchez’s policies, many Catholics were wondering whether the conflicts of past years were fated to return. The 46-year-old economics professor was sworn in after an unprecedented censure motion over alleged corruption brought down the centre-right Mariano Rajoy. But with his Socialist Party, or PSOE, claiming just 84 places in the 350-seat Cortes, and relying on support from Catalan and Basque nationalists, Sánchez will have trouble fulfilling his promise to tackle the “pressing social needs” brought on by unemployment and economic hardship. Just when you thought it was safe to go back into Spanish waters. CASTELBUONO, Sicily (Courthouse News) — Spain’s left-wing government is seeking to remove the body of dictator Francisco Franco from a fascist-era monument near Madrid and set up a commission to investigate crimes committed during Spain’s civil war and military dictatorship, a move strongly opposed by retired military officers and others. The moves by Prime Minister Pedro Sánchez and his Spanish Socialist Workers’ Party are provoking a strong reaction from his opponents — the latest being a manifesto signed by former military officers opposing the removal of Franco’s body. More than 180 retired military officers on Tuesday signed a document declaring that Franco’s memory, remains and contributions to Spain must be safeguarded from the left-wing government’s efforts to “erase” Franco from the history books. The socialist government wants to remove Franco’s remains from the Valley of the Fallen mausoleum. The Sánchez government came into power two months ago after a corruption scandal that brought down a right-wing government. The Valley of the Fallen was built in the 1950s — using the labor of political prisoners — and contains about 34,000 victims of the Spanish Civil War of 1936-1939. There are remains from people on both sides of the bloody presage of World War II. CASTELBUONO, Sicily (Courthouse News) — Spain’s left-wing government is seeking to remove the body of dictator Francisco Franco from a fascist-era monument near Madrid and set up a commission to investigate crimes committed during Spain’s civil war and military dictatorship, a move strongly opposed by <THE PEOPLE MOST LIKELY TO HAVE COMITTED THE CRIMES IN QUESTION> and others. (Courthouse News) — One year after Spain was plunged into a constitutional crisis by Catalonia’s declaration of independence, politically charged trials of imprisoned Catalan leaders accused of rebellion, sedition and misuse of public funds are approaching. The trials will be conducted by Spain’s Supreme Court. Expected to begin in December or early next year, they have the potential to spark high drama and stoke tensions in a country riven by polarization and distrust of the court system’s independence from politics. The trials risk inflaming passions in Catalonia as the drive to gain sovereignty is at a stalemate, and even losing steam. “It keeps the embers burning,” said John Carlin, a British writer and journalist who lives in Barcelona, in a telephone interview. The trials will take place in an atmosphere of distrust. The Spanish judiciary has long been accused of political partisanship because key judges are appointed by dominant political parties. MADRID (AP) — A regional election in Spain saw a surge of support for a far-right party and dealt a major setback for the ruling Socialists, whose prime minister said Monday that he will defend democracy from fear. The surprising win — the most favorable polls ahead of the election predicted Vox would win about five seats — also launched the party’s strategy to make a dent in national politics and the European elections next year. It’s also a blow to those who had felt that sour memories of Spain’s 20th-century dictatorship and a consensus over the European Union’s benefits had inoculated the country from a wave of rising populism in Europe. Spain’s political class needs to listen to the concerns of voters who support the far-right Vox party rather than dismissing them as extremists, the former French prime minister and Barcelona mayoral candidate, Manuel Valls, has warned. Valls, who served as France’s prime minister under President François Hollande from 2014 to 2016, said Vox’s breakthrough in last week’s Andalucían regional election represented a serious challenge to the political status quo. The tiny, far-right grouping won 11% of the vote and took 12 seats in the Andalucían parliament, becoming the first far-right party to win representation since the death of Franco in 1975. Wjfox found this article on the internet and posted it in another thread. I thought that it would also be appropriate to post it in this thread. Spain needs to close every coal mine by Dec. 31, 2018. Spain will stop its operations on at least 26 coal mines in 2019, putting an end to the exploitation of said mineral. 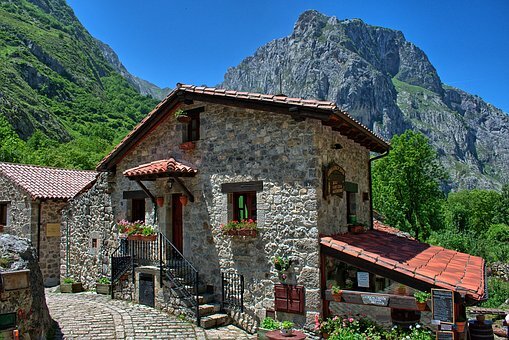 The mines that will be closed can be found in the communities of Asturias, Aragon and Castilla and Leon. The closure of these mines will affect more than 2,000 workers that are part of the special regime of coal mining. The number of employees working on the coal mining industry in 1985 was 51,420. The coal in Spain is mainly used for the production of electricity from thermal power plants. Spain has a commitment with the European Commission to abandon coal at the beginning of the decade, within the objectives established by the European Union (EU). Brussels had granted a final extension to a deficit economic activity that has more than 30 years of decline in Spain. It will cause unemployment in Spain. Spain will continue to import coal. Still, it sounds like a very big step to lessen the use of coal, which is good news. A comparison that says a lot. (TechCrunch) Uber is suspending its professional taxi service in Barcelona from tomorrow almost a year after it re-entered the Catalan capital. LONDON/MADRID (Reuters) - Authorities in Madrid and Gibraltar gave differing versions on Monday of an incident in which a Spanish warship told commercial ships to leave anchorages near Gibraltar, the latest example of tension over the strategic port as Brexit approaches. In toughly worded statements, Gibraltar said a Spanish warship ordered commercial ships to leave anchorages in British waters near Gibraltar, adding it was challenged by the British navy and sailed away, while the commercial ships stayed put. The Spanish government said the commercial ships were in Spanish waters and they left the area after being contacted by the Spanish warship. Neither side mentioned the nationality of the commercial ships.